Software size measurement is an extremely important and highly specialized aspect of the software life cycle. It is used for determining the effort and cost estimations for project planning purposes of a software project’s execution, and/or for other costing, charging, and productivity analysis purposes. Many software projects exceed their allocated budget limits because the methodologies currently available lack accuracy. The new software size measurement methodology presented in this book offers a complete procedure that overcomes the deficiencies of the current methodologies, allowing businesses to estimate the size and required effort correctly for all their software projects developed in high level languages. The Functional Software Size Measurement Methodology with Effort Estimation and Performance Indication (FSSM) allows for projects to be completed within the defined budget limits by obtaining accurate estimations. The methodology provides comprehensive and precise measurements of the complete software whereby factual software size determination, development effort estimation, and performance indications are obtained. The approach is elaborate, effective and accurate for software size measurement and development effort estimation, avoiding inaccurate project planning of software projects. 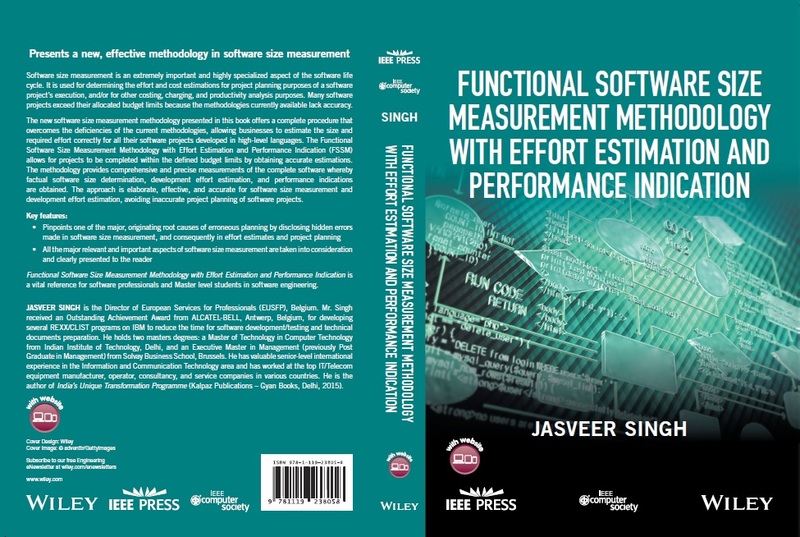 Functional Software Size Measurement Methodology with Effort Estimation and Performance Indication is a vital reference for software professional and Master level students in software engineering. Jasveer Singh is the Director of European Services for Professionals (EUSFP), Belgium. Mr. Singh received an Outstanding Achievement Award from ALCATEL-BELL, Antwerp, Belgium, for developing several REXX/CLIST programs on IBM to reduce the time for software development/testing and technical documents preparation. He earned two master degrees: a Master of Technology degree in Computer Technology from Indian Institute of Technology, Delhi, and an Executive Master in Management (previously Post-Graduate in Management) from Solvay Business School, Brussels. He has valuable senior-level international experience in the Information and Communication Technology area and has worked at the top IT/Telecom equipment manufacturer, operator, consultancy, and service companies in various countries. He is the author of India’s Unique Transformation Programme (Kalpaz Publications – Gyan Books, Delhi, 2015).